Encouraged by the success of the vulture propagation and conservation project, the wildlife wing of the Forest Department has decided to broaden the ambit of the project by bringing other species like eagles, buzzards and falcons under it. Minister for Food and Civil Supplies GS Bali will take up the problems being faced by LPG consumers of the state with Union Petroleum Minister Veerappa Moily. RK Sharma, Special Judge, Dharamsala, today disposed of the anticipatory bail application of three HPCA officials, including vice-president RS Kapoor, secretary Vishal Marwah and executive member RP Singh. Chief Minister Virbhadra Singh began his five-day tour of tribal areas of the state from Killar today. MP, Mandi, Pratibha Singh and Forest Minister Thakur Singh Bharmouri also accompanied him. Chief Minister Virbhadra Singh being greeted by tribal people at Killar on Thursday. MP Pratibha Singh and Forest Minister TS Bharmouri also seen in the picture. The local Municipal Council (MC) yesterday annulled the existing sanitary tender following unsatisfactory services of the contractor as per the conditions of the contract. Billed as the third toughest mountain biking event in the world after the Trans-Alps Challenge (Europe) and Trans-Rockies (Canada), the Discovery Montra MTB-2013 is set to emerge as a global race in the true sense with two top international bikers making entry for the first time. The arrival of world No. 9 Louis and 16th ranked Ricardo Rodrigues Martins, both from Portugal, for the six-day rally scheduled to take off from here on September 28 has raised the level of competition. Former Chief Minister PK Dhumal said today that the BJP leadership had declared Narendra Modi as their Prime Ministerial candidate keeping in view the overwhelming demand of the people. He said this step had given a new lease of life to the party. He said the youth were jubilant over the decision and a wave in favour of the BJP was visible in the country after the announcement. Former Chief Minister PK Dhumal addresses party workers at Nalagarh on Thursday. The Himachal Pradesh Congress party has started gearing up its organisation for the forthcoming Lok Sabha elections scheduled for next year. The Kangra District Congress Committee (DCC) held a day-long meeting here yesterday to strengthen the party at the grassroot-level in view of the Lok Sabha (LS) polls scheduled for 2014. Sunder Singh Thakur, party observer for the Kangra LS constituency, said during the meeting suggestions from block and district-level cadres were gathered to send to the party high command. The Estimate Committee of the Vidhan Sabha, headed by Kuldip Kumar, yesterday directed the Deputy Commissioner (DC), Mandi, to constitute a team of revenue officials to identify and expedite efforts to vest back to the state all the surplus land and defunct flats with the BBMB in Pandoh, Sundernagar, Baggi, Slapparh and others places. Brij Behari Lal Butail, Speaker, Himachal Pradesh Assembly, who is also local MLA, has directed officers of different departments to take up the repair of roads, drinking water supply schemes, power supply lines and water channels on a war footing. He said the monsoon was almost over in the state and official machinery should be geared up so that no inconvenience was caused to the public. The police has released the sketches of two suspected killers who shot dead a person in the Amb sub-division of Una district four days ago. Anupam Sharma, SP, Una, said sketches had been prepared as per the information provided by the wife of the deceased who was riding the pillion on motorcycle when her husband was shot dead. While presiding over a meeting of the Board of Directors (BoD) of the Himachal Pradesh State Industrial Development Corporation (HPSIDC) here today, Industries Minister Mukesh Agnihotri lauded the efforts of the management in earning a net profit of approximately Rs 4 crore in financial year 2012-13. Two persons were feared dead and three others injured seriously when a Mahindra Max they were travelling in plunged into a deep gorge at Bagotu on the Chamba-Killar highway in the Pangi valley yesterday, reports reaching here today said. The reports said the search operation was on to recover the bodies of the deceased, while the injured had been extricated. They were referred to different hospitals for treatment. A sum of Rs 5 lakh was stolen from Punjab National Bank (PNB) at Baddi today when officials were trying to put the cash inside the ATM installed in the bank premises. The CID wing of the Kangra police today arrested a youth and recovered 1 kg opium from him. The police said on a tip-off it stopped Pomil Kumar of the Chari area, while he was going to McLeodganj down the Khara Danda road. The dwindling population of vultures in the state has registered an appreciable increase to almost 800 ever since protected areas were created for these natural scavengers in Kangra district. With the presence of 22 species of raptors being sighted and recorded in Himachal, the wildlife wing has decided to create protected areas for other species of vultures and eagles, so that they can be saved from getting extinct. “We have decided to prepare a baseline date of these species of raptors found in Himachal so that their migratory behaviour, habitat and food preferences can be studied so that in-situ conservation projects can be started for their protection and increase in population,” said AK Gulati, Principal Chief Conservator of Forests, Wildlife. He added that during the recent survey undertaken to estimate the number of vultures in the state, more than 25 birds of different species were sighted. Though vultures have been sighted in Kangra, Nalagarh and Nahan areas, the foray of these birds into new areas like Chamba and Kinnaur have raised hopes for undertaking conservation and breeding projects of some other rare species like white eyed buzzard, eagles, Himalayan griffon and vultures. A total of 70 species of vultures, hawks, buzzard, kites, harriers and falcons are found in the Indian sub-continent. The creation of 27 nesting sites spread over 10 hectares each in the pine forests in Kangra district has brought about encouraging results with the number of vultures increasing to over 800 from a mere 30 in 2004-05. The vulture sites are mainly concentrated in Parol, Salol, Chadevh, Daulatpur and Mastgarh as these areas have ample mother pine trees that vultures find most suitable for setting up their nests. The Wildlife Department also proposes to set up two vulture restaurants near Pong Dam where carcasses from ‘gau sadans’ will be provided. Besides, this new vulture safe zone will be set up near Nahan and in Mandi district. The banning of diclofenac drug administered to livestock has helped in saving vultures from a certain death. Bali said reports were being received from all over the state that LPG consumers had not received Aadhaar cards yet. Now the Supreme Court has stayed the linking of Aadhaar card with the Union Social Welfare or Subsidised LPG Cylinder Schemes, the Centre is planning to file a review petition in the matter. “In this scenario, many LPG consumers are facing problems either at the end of LPG agencies or Aadhaar card issuing authorities. I will request the Union Petroleum Minister to allow the sale of subsidised cylinders in the state till the matter of linking of Aadhaar cards with the Direct Benefit Transfer (DBT) Scheme is sorted out,” he said. About 10,500 kg wheat grains allegedly stolen from PDS shops, which were confiscated by the police in Chamba two days ago, Bali said the confiscated food grains contained wheat grains stolen from the PDS shops in Punjab. Regarding culprits hailing from Himachal, he said, “I have ordered the police and the department officials to take strict action against the accused,” he said. To avoid such incidents in future, the minister said boundary walls were being erected around ration godowns in the state and close circuit cameras would be installed to monitor the movement of food grains from government godowns. A Rs 22-crore project had also been sent to the Union Government for online monitoring of food grains being distributed though the PDS in the state, Bali said. Regarding non-availability of sugar in many depots of the state, the minister said now the fault was on the part of the PDS shop owners. “As per rules, shop owners have to deposit security with the Food and Civil Supplies Department before lifting sugar. However, many PDS shop owners are not depositing the amount with the department due to which a delay in supply is being caused,” he said. He said the officials of the department had also been directed to take action against such PDS shop owners. He said special gram sabha meetings would be held across the state to decide the number of beneficiaries under the Food Security Programme of the Government of India. "The meeting is being held so that no deserving person should be left out," he said. Bali also attended a meeting of district officials to review the progress of various government schemes. He said the officials had been directed to stop wasteful expenditure and increase income. In many cases, contractors were maintaining roads under various Union Government schemes. It has been found that guilty contractors were being let off with minor penalty by the department and the government was repairing road at its own cost. The officials were told to impose heavy penalty on such contractors. RK Sharma, Special Judge, Dharamsala, today disposed of the anticipatory bail application of three HPCA officials, including vice-president RS Kapoor, secretary Vishal Marwah and executive member RP Singh. The court disposed of the application on the plea that anticipatory bail application of the HPCA officials was premature. The said officials had moved an anticipatory bail application in the court of Special Judge, Dharamsala, on the plea that the state Vigilance, which had registered a case against the HPCA, might arrest them. On their application, the court issued notice to the Vigilance and Anti-Corruption Bureau. The Vigilance officials then called the said HPCA officials for questioning at Dharamsala office. In their reply filed in the court, Vigilance officials said till date, they had nothing against the said HPCA officials and, therefore, their application seeking anticipatory bail should be rejected. However, the HPCA officials maintained that direction should be issued to the state vigilance that notice should be issued to them before any move of arrest. The Chief Minister laid the foundation stone of the Mini-Secretariat building at Killar to be constructed at an estimated cost of Rs 20.80 crore. On completion, it will provide facilities to people of the area for getting their works pertaining to various departments done under one roof. The six-storeyed building will have the Resident Commissioner, SDM, BDO, Agriculture, Veterinary, I&PR and other offices, along with parking facility. Speaking on the occasion, Virbhadra directed the officers working in tribal areas to complete the ongoing works keeping in view the limited working season so that these did not get hampered due to unfavourable weather conditions in the ensuing winter. He directed the officers to complete the construction work of the Government Degree College and a hospital building in Killar at the earliest. The Chief Minister said tribal areas of the state had a rich cultural heritage, which needed to be preserved and promoted. He said the state government was making efforts to promote these areas as religious tourism destinations. He said the temple of Mata Mindhal would be taken under government control, and proper upkeep and maintenance would be done to facilitate the pilgrims. Virbhadra regretted that the previous BJP government had neglected the interests of people and various jobs were provided on the basis of party lines, whereas the Congress government was committed to provide jobs on ability and merit basis. He said the state government was endeavouring to fill up all the vacant functional posts in the tribal and hard areas and preference would be given to the local youth. He said the Congress government was striving to connect tribal and hard areas with tunnels, which would not only reduce distances, but also boost tourism activities in these areas. He said a tunnel would be constructed at Chehni and Rs 30 lakh had been sanctioned for conducting its survey. The Chief Minister announced the upgradation of the government high school at Karyuni, to government senior secondary school, the government middle schools at Shore, Phindru and Karyas to government high schools and the opening of a primary school at Chlasri village. He also announced the opening of an HRTC sub-depot at Killar, a veterinary dispensary at Chaloli village and the construction of a footbridge at Sandhari. MP Pratibha Singh thanked people of the Pangi valley for their overwhelming support to ensure her victory in the recently held elections. She said the Congress governments had always given top priority to the development of tribal areas. Chief Minister Virbhadra Singh was presented a draft worth Rs 1.23 lakh towards the CM’s Relief Fund by Forest Minister Thakur Singh Bharmouri and Director, Fisheries, Gurcharan Singh, on behalf of employees of the Fisheries Department at Killar in Chamba district today. Another draft of Rs 51,000 was also presented to the Chief Minister by Shiv Nath Sharma, vice-president, NGOs’ Federation, on behalf of Scheduled Caste and Scheduled Tribe employees of the Pangi valley towards the fund. According to sources, the contractor had to provide at least 19 sanitary workers for maintaining proper sanitary conditions in the town. But he failed to provide the requisite number of workers as per the condition of the contract awarded to him for the current financial year. Owing to poor sanitary condition in most of the wards in the town, there was a lot of resentment among the residents. RS Verma, MC executive officer, said following the complaints of unsanitary conditions in the town for the last few months, a sub-committee led by MC vice-president YP Soga had been constituted to monitor the present situation. ? The committee in its report on September 24 stated that the sanitary contractor had failed to render satisfactory services due to meagre number of sanitary workers as per the condition of the contract. The MC had served a show-cause notice to the contractor, but he failed to give a satisfactory reply. Finally, the MC had annulled his contract with immediate effect, Verma said. Meanwhile, MC Chairperson Krishna Mahajan said the MC had made temporary arrangements for sanitation in the town and called for fresh tenders on September 30. Billed as the third toughest mountain biking event in the world after the Trans-Alps Challenge (Europe) and Trans-Rockies (Canada), the Discovery Montra MTB-2013 is set to emerge as a global race in the true sense with two top international bikers making entry for the first time. The arrival of world No. 9 Louis and 16th ranked Ricardo Rodrigues Martins, both from Portugal, for the six-day rally scheduled to take off from here on September 28 has raised the level of competition. In fact, it is for the first time that internationally ranked bikers are taking part in an event in the country. Ricardo is a three-time champion of Portugal. In all 84 bikers, including 16 foreigners, are participating in the event. There are eight women, including two foreigners, among the participants. The defence forces, which have been part of the annual event since 2006, will have sent the largest contingent of 21 participants for the 9th edition of the rally. The Indian Army has entered five teams consisting of two members each and five solo riders, and the remaining six are from the Indian Air Force. They include Shishir Man Karki and Naresh Deb Burman, last year's winners of the "Team of Two" category. The 491-km rally will be tougher compared to earlier editions as the organisers have changed the format by replacing the numerous short competitive stretches with fewer longer ones and increasing the single track and average uphill climb. The endurance of the cycles and the mental toughness of the riders will be put to a real test in the treacherous hill terrain of Shimla and Kullu districts as the average ascend will be 1,800 m to 2,000 m per day, compared to 1,200 m to 1,400 m per day last year. The bikers will have to pedal right up to the 3,300 m Hatu peak, overlooking the tourist destination of Narkanda, which is the highest point of the rally. It is 300 m higher than last year's highest point of the Jalori pass. The track includes some hike and bike sections also. There will be only one 60 to 70-km stretch every day unlike the past when two or three small competitive sections of 15 to 20 km were included. Mohit Sood, president, Himalayan Adventure Sports and Tourism Promotion Association (HASTPA), which has been organising the race, said changes in the format had been effected to bring the event in line with the parameters set by the United Cycle International (UCI). It would help attract more foreign participants, he added. Former Chief Minister PK Dhumal said today that the BJP leadership had declared Narendra Modi as their Prime Ministerial candidate keeping in view the overwhelming demand of the people. He said this step had given a new lease of life to the party. He said the youth were jubilant over the decision and a wave in favour of the BJP was visible in the country after the announcement. Dhumal stated this while addressing workers at various party meetings held at the Arki, Doon and Nalagarh constituencies today. He alleged that under the Congress rule, neither the country nor its people were feeling safe and were eagerly waiting for the parliamentary polls so that the inefficient UPA government, led by the Congress, could be ousted. The former Chief Minister urged party workers to raise issues like corruption and price rise which had been “propagated by the Congress”. He said people would give a “befitting reply to the Congress in the polls for their vindictive acts”. Lauding the decision of the party high command in elevating Modi as their Prime Ministerial candidate, he said the BJP was not a family-centric party and any capable individual with the calibre to lead could be elevated to the top post. He termed the nine-month rule of the Congress government in the state “as smitten in vendetta”. He alleged that apart from settling political scores, the government had failed to undertake any development steps to benefit people. He alleged that the Atal School Uniform Scheme, which provided free uniform to 10 lakh schoolchildren in the state twice a year, failed to be implemented now and despite a lapse of nine months, children had not been given any uniform. He alleged that the Congress had set a record of indulging in various scams and the state government was misleading investors on the issue of Central industrial package, which had been unduly curtailed by the Congress government at the Centre. 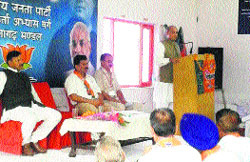 As a step towards poll preparedness, the BJP was gearing up its cadres for the parliamentary polls and apart from former Chief Minister Dhumal, party’s state president Satpal Satti and state general secretary Dr Rajiv Bindal also addressed party workers. Dhumal said Modi would address a state-level workers meeting which would be held after the completion of the mandal and district-level camps in the state. The leaders urged the party cadres to work in unison and sink all the differences to strengthen the party as this alone would fulfil their objective of elevating Modi as the Prime Minister of the country. Addressing mediapersons here yesterday, Kewal Singh Pathania, state Congress party observer for the Bharmour and Churah Assembly constituencies, said to strengthen the party base at the polling booth level, a 10-member committee of party activists was being constituted. Pathania said these committees were being directed to educate people about the benefits of the Food Security Bill and MGNREGA launched by the UPA government at the Centre for poverty alleviation. He said the UPA government’s Food Security Bill and MGNREGA programmes had become popular in the country and been acclaimed across the world. The party was holding workers’ meetings at the block level and awakening people to derive benefits from these programmes, Pathania added. Slamming the previous BJP government for its half-hearted approach towards the development of the state, Pathania cited an example of Bharmour block where 19 schools had been closed down during its rule. They included 10 primary, five middle and four senior secondary schools. Speaking about the achievements of the Congress government in the state, Pathania said as many as 3,000 posts had been advertised to fill vacancies in different departments. The process to provide skill development allowance had been initiated. Besides this, the formulation of a policy for the regularisation of PTA teachers was also underway, he further stated. 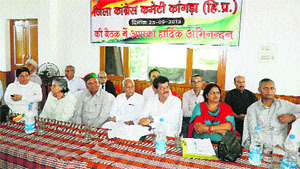 The Kangra District Congress Committee (DCC) held a day-long meeting here yesterday to strengthen the party at the grassroot-level in view of the Lok Sabha (LS) polls scheduled for 2014. Sunder Singh Thakur, party observer for the Kangra LS constituency, said during the meeting suggestions from block and district-level cadres were gathered to send to the party high command. Sunder Singh said he was defeated during the previous Assembly polls from the Banjar Assembly constituency because of the infighting within the party. This time he would take steps to cement dissensions within the party in the Lok Sabha constituency, if any. Regarding the Congress candidate from Kangra, Sunder Singh was evasive. However, it was learnt that among the front-runners were Prof Chander Kumar, former minister, Viplove Thakur, former HPCC chief, and RS Bali, state Youth Congress vice-president. On the occasion, Hari Om Sharma, state vice-president, BSP, joined the Congress. Those present in the meeting included Suman Verma, Sanjeev Gupta, Prof Chander Kumar, Viplove Thakur, Jagjeevan Pal, Kishori Lal, Ajay Verma, and RS Bali. The Estimate Committee of the Vidhan Sabha, headed by Kuldip Kumar, yesterday directed the Deputy Commissioner (DC), Mandi, to constitute a team of revenue officials to identify and expedite efforts to vest back to the state all the surplus land and defunct flats with the Bhakra Beas Management Board (BBMB) in Pandoh, Sundernagar, Baggi, Slapparh and others places. However, estimates given by respective legislators were still pending and detailed project reports (DPRs) were not being made by the PWD, IPH, BDOs and others, said Sanjay Rattan, a member of the committee. “We are answerable to the public and if you have not submitted DPRs, how and when the project targets will be achieved,” he said. The BBMB representative was pulled up by Kuldip Kumar and committee members Maheshwar Singh, Mahender Thakur, Sarveen Chaudhary and Inder Singh at the meeting as he had no specific answer to queries on surplus land, vacant, defunct and occupied flats available with the BBMB at Pandoh, Baggri and Slappar and Sundernagar colonies. The committee members expressed shock when the BBMB official told them that the “available surplus land was vested with the state and the BBMB had a sublet committee to renovate and allot defunct or vacant flats”. Kuldip Kumar directed Devesh Kumar, DC, Mandi, to expedite efforts to find out how many flats were vacant and defunct and occupied by tenants through subletting and how much land was surplus with the BBMB and submit the report to the committee for the next hearing. The committee members were unanimous that funds for relief in disasters should be proportionately distributed in affected areas. The committee found that damage worth Rs 1.79 crore was caused in Sarkaghat sub-division mainly in Dharampur, but only Rs 36 lakh had been distributed there so far. The DRDA project officer and BDOs were not aware of the fresh guidelines on MNREGA issued by the Ministry of Rural Development about raising public paths and retaining walls damaged by landslides and flash floods. Earlier, the pubic account committee headed by Ravinder Ravi early this month had pulled the excise officials as they were not updated with the latest figure and not prepared to answer queries on its target. Butail was addressing local officers here today. He had called a meeting of officers to review development works going on in Palampur. He specifically asked the PWD to repair all roads which had deep potholes. He said these works should be completed in a time-bound manner. Butail directed the IPH Department to repair all leaking pipes and fire hydrants in the town which had become a big problem and were damaging the roads. He said the department should also initiate steps to repair the sewerage lines leaking in lower areas of the town. The Speaker also stressed the need for the early completion of the Garbage Disposal Plant being constructed by the local Municipal Council. He said if this plant became operational, then the garbage of panchayats areas could also be lifted and disposed of. Butail said there would be zero tolerance for corruption and all officers should perform their duty with full devotion. He said there would no compromise with the quality of construction in civil works being executed by different departments. Public visiting government offices should also not be harassed for petty issues, he added. Ashwani, a resident of Andora village in the Amb sub-division of Una district, was shot dead when he was going back home along with his wife and son on his motorcycle on the Amb-Mairi road late in the evening on September 22. Two masked persons came on a motorcycle and shot Ashwani. The accused fled from the spot. However, since no apparent attempt was made for loot, the police is looking for rivalry angle in the case. He said the HPSIDC had made significant improvement in its operation and hoped that the endeavours would continue in future also. The board approved 8 per cent ADA to the employees of the corporation and decided to release ex gratia payment to all the employees and officials at the rate of 8.33 per cent of salary subject to maximum of Rs 15,000. The board also approved payment of dividend at the rate of 5 per cent of the profit to the state government, which amounted to Rs 1.54 crore. Besides, a proposal for the construction of foodgrain storage godowns at Baddi and Parwanoo for the Food Corporation of India was also approved unanimously. Agnihotri also directed the Himachal Pradesh State Handicraft and Handloom Corporation to prepare schemes for weavers and artisans while presiding over the 161th meeting of Board of Directors of the Himachal Pradesh State Handicraft and Handloom Corporation here today. The incident occurred around 1:10 pm today when two youths entered the bank and noticed Rs 5 lakh lying on the counter behind the head cashier. They managed to pick up the cash without anyone noticing them and fled from the spot. Minutes later when the bank staff realised the loss, they informed the police, who, despite managing to see the closed-circuit camera footage, failed to locate the youths. A police team is deployed about 50 m near the bank and at several other places in the close periphery of the bank, yet the miscreants managed to flee with this cash in broad daylight. Superintendent of Police S Arul Kumar said they were ascertaining the identity of the miscreants from the CCTV footage and would nab them. The incident was the second of its kind in as many days where a miscreant had broken the glasses of a parked car in a guest house at Nalagarh and attempted to run away with cash worth Rs 4 lakh. The attempt was thwarted by an alert Sukhdev Singh who had thrown a brick at miscreant Sunil Kumar, who was trying to flee from the spot on a bike. Sunil was arrested later by the Nalagarh police. The accused had concealed under his clothes 1 kg opium which he was allegedly going to supply to retailers in the McLeodganj area. The police has registered a case under the NDPS Act. He will be produced in the court tomorrow. Mohit Chawla, ASP, Kangra, said further investigation in the case was going on.